Salad cream is a creamy yellow condiment based on an emulsion of about 25-50 percent of oil in water, emulsified by egg yolk and acidified by spirit vinegar. It may include other ingredients such as sugar, mustard, salt, thickener, spices, flavouring and colouring. It was introduced in the United Kingdom in the 1920s, where it is used as a salad dressing and a sandwich spread. Due to the higher cost of ingredients during periods of rationing in the United Kingdom a flavour similar to mayonnaise was achieved in the creation of salad cream. In the United Kingdom, it has been produced by companies including H. J. Heinz Company and Crosse & Blackwell. Heinz Salad Cream was the first brand developed exclusively for the United Kingdom market. When first created in the Harlesden (London) kitchens of Heinz in 1914 the preparation was done by hand. Salad cream is available in most supermarkets in Canada and Ireland, as well as in Australia, where its taste may closely resemble that of "mayonnaise" as it is produced in that country. 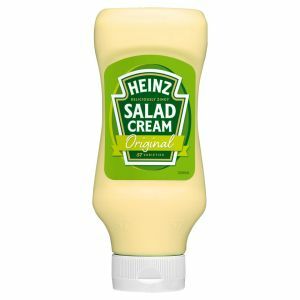 Salad cream was not readily available in the United States until the 21st century; however, with the large population of British expatriates, especially in the Northeast, it is becoming more common. Apart from many expat stores, major retail supermarket chains such as New York-based Wegmans, Maine-based Hannaford, Massachusetts-based Stop and Shop, Florida-based Publix, Michigan-based Meijer, and California-based Fresh & Easy now sell salad cream as a regular item. Many supermarkets sell national and store brands of salad dressing which resemble salad cream.